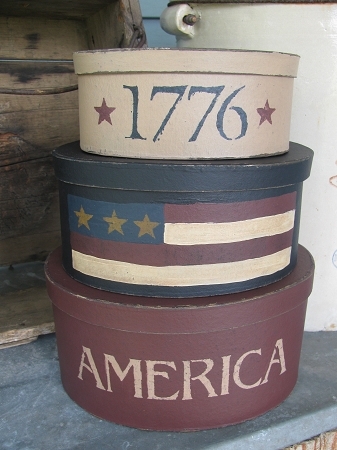 Primitive America Flag 1776 Hand Painted Oval Set of 3 Stacking Boxes. 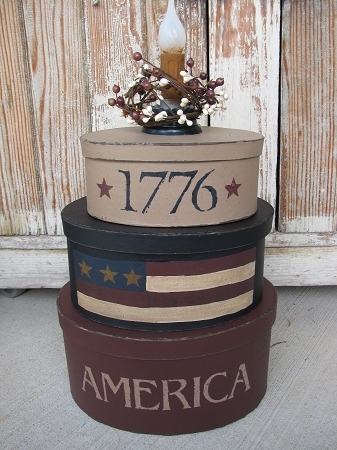 Perfect set of boxes for the summer months or your Americana themed decor. Hand made and hand painted. The bottom box is burgundy with AMERICA painted on it in khaki tan color. The middle box is dark navy blue with our American flag painted on. Last but not least, is the top box. It's been painted khaki tan with 1776 and some stars painted alongside. There is an option with this set to have an electric candle lamp attached to the top box lid. See the other image. It's an upgrade of $10.00 to make it into a light. The primitive candle light is attached to the top box light and an Americana pip berry wreath rests around the lamp base. The cord comes with an on/off switch. The silicone light bulb is also included. Size stacked is 14" high by 10"x7 3/4". Size WITHOUT the light is 12" high by 10" x 7 3/4" Hand painted, designed and signed by Heidi. Also WITH or WITHOUT the light. Please see options.